NSO the sky tonight, see how the sky changes throughout the evening. NSO day and night, see the Sun and stars rise and set over 24 hours; see this in spring, summer, autumn and winter. NSO electric orrery, explore the retrograde motion of Mars. Next period of retrograde motion is Feb - May 2012. NSO stars How far away are the stars? How are they formed and how do they die? Are all stars the same? What keeps them shining? 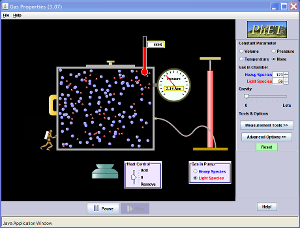 Try this PhET simulation of a gas. You can investigate all the gas laws - Boyle's law (constant temperature); Charles's Law (constant pressure); the pressure law (constant volume). VPLab has some very useful animations / simulations too - Boyle's Law, Charles's Law; Absolute Scale; Molecular Model.